I hope everyone enjoyed their Thanksgiving! I hope it was filled with lots of delicious food and wonderful company. I know ours was! 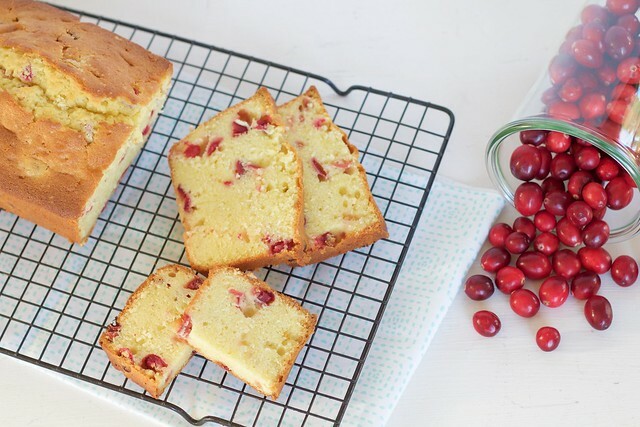 Since I have just recently come to appreciate cranberries, I have been trying some new recipes. I am always willing to make any sort of pound cake! I love how you can eat a pound cake for dessert, or with your coffee. Or maybe only I do that? 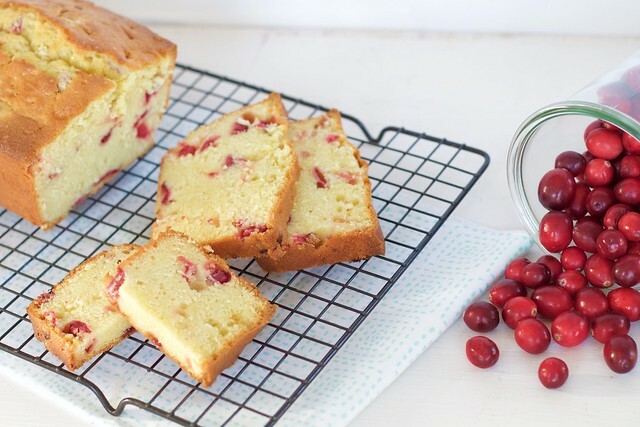 This cranberry pound cake is perfectly moist, not overly sweet, with a hint of tartness from the cranberries. I think it makes a great, simple treat any time of the day! I bet it would be even better with lightly sweetened, freshly whipped cream. Any way, or any time you eat it, it will be worth it! Preheat the oven to 300ºF. Grease an 8 1/2x4 1/2 inch loaf pan. Set aside. In a large liquid measuring cup, whisk together the eggs, and vanilla extract together. In a small bowl, whisk together the flour, 3/4 teaspoon salt, and baking powder together. In a separate small bowl, whisk together the sour cream and milk. In the bowl of a stand mixer fitted with the paddle attachment, beat the butter on medium-high speed until light and creamy, 2-3 minutes. Scrape down the bowl, then beat in the granulated sugar. Beat, on high speed, until pale and fluffy, 3-5 minutes. Reduce the speed to medium and add the egg mixture in a slow, steady stream. Continue to mix until completely combined, another minute or so. Reduce the speed the low and all the flour mixture in 3 additions, alternating with the sour cream mixture. Begin and end with the flour. Scrape the bowl down as needed. Mix until completely combined. In a small bowl, toss the chopped cranberries with the confectioners' sugar and 1/8 teaspoon salt. Gently fold the cranberries into the batter. Scrape the batter into the prepared loaf pan and smooth the top. Place in the oven and bake for 1 hour and 50 minutes to 2 hours, or until a butter knife inserted in the center comes out clean. Let cool in the pan for about 15 minutes, then turn out onto a wire rack, and let cool for about 2 hours before slicing and serving. Wrap any leftovers with plastic wrap and refrigerate up to 5 days.